The number of children affected by autism continues to rise. Most likely your life has somehow been touched by autism. This inexplicable disease has inspired many families and educators to find joy in small successes. My own son has special needs, although not autism, and I can relate to how families struggle and celebrate. The suspected culprit: Monsanto’s Roundup! To be clear, correlation is not the same as cause; however, the evidence is strong. 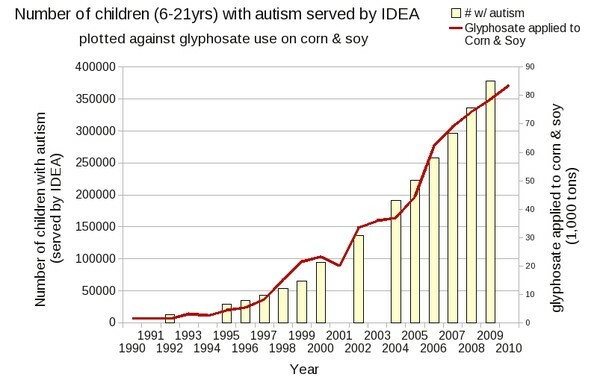 he key slide in Seneff’s presentation is the one above, showing the uncanny correlation between heavy use of glyphosate (via Roundup), begun in 1990 and increased sharply each year following, and the explosion of autism, such that we have gone from one in 5,000 children being diagnosed back in 1975 to one in 68 today. -Glyphosate sickens by killing beneficial gut bacteria and stimulating the loss of key minerals like cobalt, iron, and manganese. -Glyphosate is present in unusually high quantities in the breast milk of American mothers, to the tune of 760 to 1,600 times the allowable limits in European drinking water. -Children with autism have biomarkers indicative of excessive glyphosate, including zinc and iron deficiency, low serum sulfate, seizures, and mitochondrial disorder. -The number of adverse reactions from vaccines can be correlated as well with autism and glyphosate, though not quite as closely. -The same correlations between applications of glyphosate and autism show up in deaths from senility. There are other factors, including lack of exposure to sunlight and vaccines, that have been linked to increased rates of autism, but none of these are as strongly correlated as RoundUp usage. I can’t watch her whole two hour presentation. It is too upsetting. I stand firm in my anti-RoundUp views. Please don’t use it around your home. Please support organic farmers. Please drink organic wine. « SipSnap: Universal sippy cup and straw lids for any cup!